Uncontrollable wildfires leave at least 11 people dead in California. Nature won’t spare the United States this year. Not only hurricanes have claimed lives this year; wildfires are also wreaking havoc. At least 13 people have died of uncontrollable flames that have devoured the state of California so far this year, 11 of which have been in Napa and Sonoma counties in the north of the state. According to official figures from the Marin, "more than 1,500 houses and businesses have been totally burned and 30,000 people have had to be evacuated," El País reported. During the night of Sunday, several outbreaks were reported in California's wine growing zone, north of San Francisco Bay, and by Monday night there were at least 10 deaths: 7 in Sonoma County, 2 in Napa and 1 in Mendocino, according to the California Department of Forestry and Fire Protection. The Sonoma County Sheriff confirmed these numbers through his Twitter account. Additionally, more than 100 people have had to be assisted - between burns and suffocations - and there are hundreds that don’t have gas, electricity or running water. State Governor Jerry Brown has declared a state of emergency after the fire devoured 30,000 hectares, fueled by strong winds of up to 80 kilometers per hour, which have brought smoke and ashes to the city of San Francisco. The governor urged that the event should be declared a "major disaster", insisting on the official request to President Trump to authorize the federal resources necessary for such situations. With 15 active outbreaks, affected counties have lost hotels, houses, bars and wine cellars, adding up to 1,500 completely destroyed properties. Some 20,000 people have been displaced, the BBC reported. 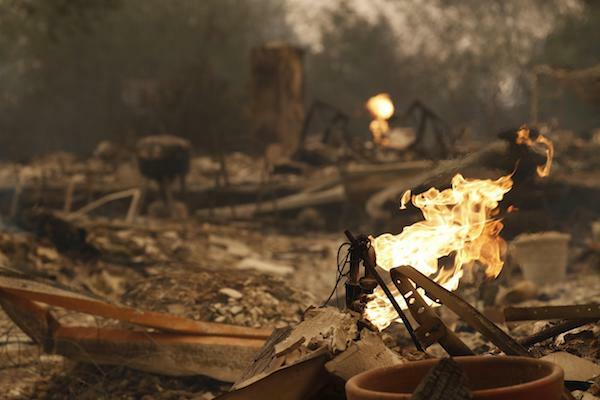 "Almost all of our efforts last night and early this morning have been focused on evacuating and mobilizing citizens from danger zones," California Department of Forest and Fire Protection Director Ken Pimlott said on Monday. Since then, new outbreaks have been identified in the hills of Anaheim that have devastated more than 800 hectares, according to Animal Político.